This Walter Netsch designed facility with modern updates sits at the “Front Door” to the East Campus. Located on Halsted St. just south of the Jane Adams Interchange; it affords sweeping views of the Chicago Skyline. This venue provides a variety of meeting rooms to fit just about any need. The Tower Rooms consist of 7 spaces, spread over three floors, housed at the north end of Student Center East. Along with its anteroom, this comfortable space, with brick features is ideal for medium sized lectures or meals. Complimented with carpeting and shear curtains the room has an inviting natural feel. Coupled with a small lounge area, this in demand location is a favorite venue of our guests. Fort Dearborn AB is a horseshoe shaped space featuring a curved wall of art and low ceilings. A is an open space with access to Illinois C and overlooks the East Terrace. It is best used as a pre-function space or registration area. B, with its views of the inner campus and overlooking the West Terrace, works great as a breakout room accommodating up to 90 in an auditorium setting. Combined, Fort Dearborn is perfect for receptions and small gatherings. Illinois A, B & C create the largest space available in the venue. The soaring 20ft. high, carpeted rooms provide an open and spacious environment allowing for a variety of configurations. Illinois B & C feature floor to ceiling widows with northeast views of the city, with Illinois A featuring an accent wall. Each room is equipped with built-in Audio and Visual components. The combination of Illinois A & B allows for auditorium seating for 500+ or dining for 300. 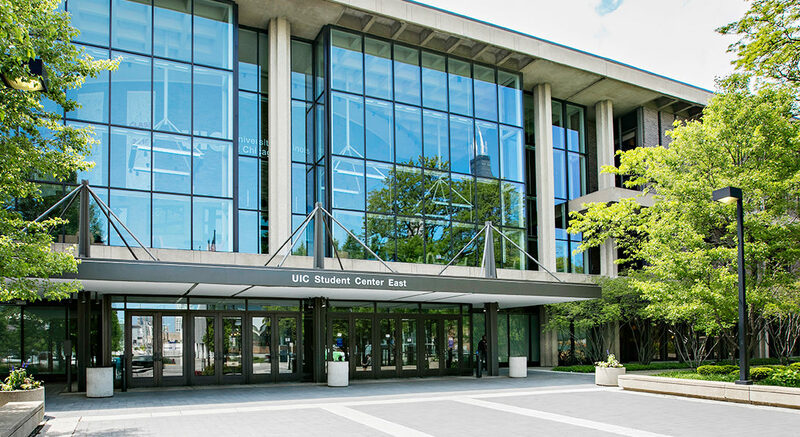 Illinois C can host lectures for over 100 guests or a more intimate dinner setting for 56. Illinois B & C can be paired with a foyer allowing for registration or catering space. The rooms easily accommodate anything from medium sized productions to vendor/employment fairs. Room arrangements and capacities are customized based on event.